When it comes to tribute bands, you can't go past this show. 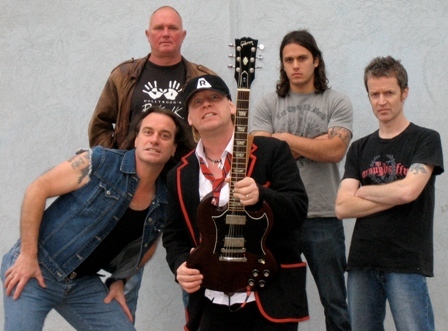 This is not only one of the best tribute shows going around, this is the BEST AC/DC tribute. Formed in 1988 and known as “BACK IN BLACK”, THUNDERSTRUCK has been wooing audiences for more than 20 years. Lead vocalist, B.J. Vernal, not only covers the songs of Brian Johnson brilliantly, but sounds so much like Bon Scott on the eariler AC/DC, you would think “he is possessed by the great mans spirit”, as one fan put it. Put this together with Australia's best rhythm section of (Original member) Steve Mitchelmore (drums), Dave Ross (bass) and Danny Borthwick on rhythm guitar as Malcolm Young and you have got one fantastic show! (see bio's for more info). If anyone out there who has footage or pics from our shows and would like to share/forward them onto us, it would be much appreciated. Just go to our contacts page, click on the email link & put THUNDERSTRUCK Pics or Footage, or both in the subject line. SATURDAY 1st - Mr Pockets, TULLAMARINE. 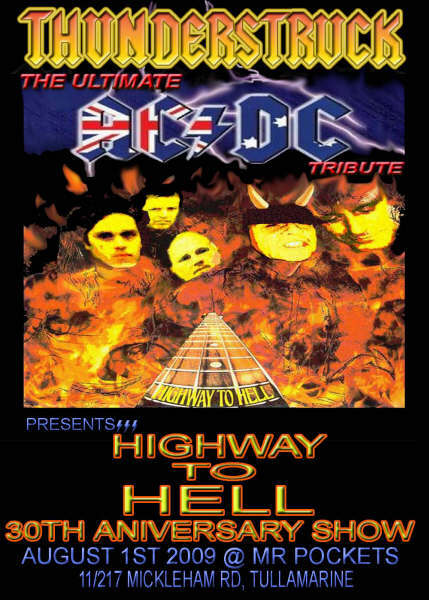 HIGHWAY TO HELL 30th ANIVERSARY SHOW. Playing the whole album; LIVE. Then 90 minutes of full on AC/DC CLASSICS. Highway To Hell CD GIVEAWAYS. SATURDAY 8th - Workmens Club, WONTHAGGI. SATURDAY 15th - Deakin Waterfront Cafe, GEELONG. SATURDAY 22nd - The Handle Bar, LAUNCESTON. SATURDAY 29th - RSL, CHELSEA.